Is there a prize for anyone who stays awake for the entire screed? A lifetime supply of Sominex? This dude puts me to sleep in two minutes. How on earth in the balance can someone handle 24 hours of this colossal bore? 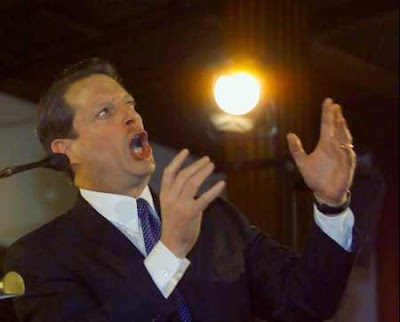 Former President Al Gore will renew his 30-year campaign to convince skeptics of the link between climate change and extreme weather events this week in a 24-hour global multi-media event. "24 Hours of Reality" will broadcast a presentation by Al Gore every hour for 24 hours across 24 different time zones from Wednesday to Thursday, with the aim of convincing climate change deniers and driving action against global warming among households, schools and businesses. The campaign also asks people to hand over control of their social networking accounts on Facebook and Twitter to it for 24 hours to deliver Gore's message. Hand over control of Twitter and Facebook accounts? Gee, what could go wrong with that risky scheme? "There will be 200 new slides arguing the connection between more extreme weather and climate change," Trewin Restorick, chief executive of the event's UK partner Global Action Plan, told Reuters on Monday. "There will be a full-on assault on climate skeptics, exploring where they get their funding from." Hmm, a full-on assault? Sounds pretty violent. Won't this scare the children or something? The Goracle claims for 24 hours, we will all live in reality. Unlike the rest of the year when Gore lives in his massive oceanfront mansion laying down a carbon footprint that dwarfs mere mortals. Here's an idiotic video clip through their link. In Gore's typical cowardly fashion, you can't comment on it. That sure is a means of stifling those evil deniers! So much for an honest debate.